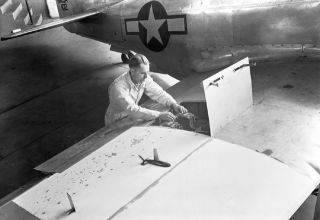 A NACA technician prepares to use a P-51D for transonic testing. In this historic 1946 photo from the U.S. space agency, a semispan airplane model and flow-direction vane mounted on wing of P-51D airplane for transonic tests by wing-flow method. The National Advisory Committee on Aeronautics, (NACA) was a precursor to NASA. NACA was created by Congress in 1915.